Calorimeter is a container filled with water and insulated.Since it is isolated, there is no heat lost or transfer with surrounding. Matters are placed into the reaction container. With the help of stirrer, we make temperature of water same at everywhere. 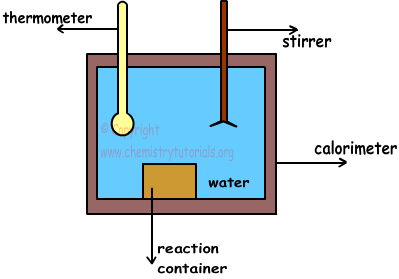 Moreover, thermometer is used to measure temperature of water before and after reaction completed. Ti < Tf, reaction gives heat to water and make increase its temperature. Thus, it is exothermic reaction. Ti > Tf, reaction absorbs heat from water and make decrease its temperature. Thus, it is endothermic reaction. mcal= mass of calorimeter, in g.
mwater= mass of water in g.
We know number of mols of reactants. According to coefficient of matters in reaction, ∆H value is calculated. If temperature of system increases then, reaction is endothermic, we take ∆H positive. If temperature of system increases then reaction is exothermic and ∆H becomes negative. Example: Which ones of the following applications are exothermic? Sum of products' bond energies is larger than sum of bond energies of reactants. II. When compound A dissolves in water, temperature of water decreases. Reaction given above takes place in insulated container and pressure in the container increases. I. If sum of bond energies of products is larger than bond energies of reactants, energy released from forming new bond in products is larger than the energy used to break bonds of reactants. In other words, reaction is exothermic. II. If temperature of water decrease, then reaction absorbs heat from water. Thus, reaction is endothermic. III. In this reaction moles of gases decreases, on the contrary pressure increases. To increase pressure, temperature of system also increase. So, reaction must be exothermic.